In 1989, just after we got married, I bought a book on Curries by Pat Chapman from Sainsbury’s. Despite now owning several other curry recipe books, it’s still our ‘go to’ book for all things spicy! 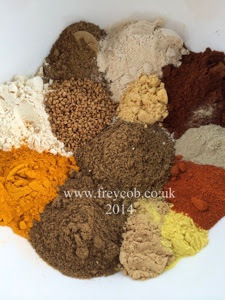 We’ve been blending the spices into curry powder and cooking it out in to a curry paste ever since then. 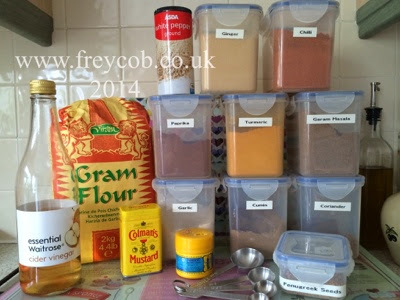 It’s been tried and tested by many a guest to our house over the years, and as I used almost the last of my current batch making my chicken curry for dinner last night, I had to make some more today. 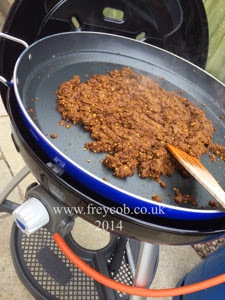 The benefit of making it today in the warm, dry weather, meant that I could cook it outdoors on my Cadac barbeque in the paella pan; sharing the amazing aroma with my neighbours and leaving my house smelling fragrant and not spicy for the next few days! It’s incredibly simple to do, so here it is in it’s entirety. All teaspoon measurements are ROUNDED. 1. Measure all your ingredients into a large bowl. 2. 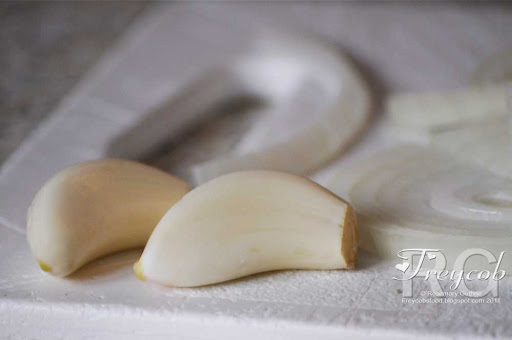 Pour in your cider vinegar and enough cold water to make a paste that ‘dollops’ off the spoon without being too runny. 3. 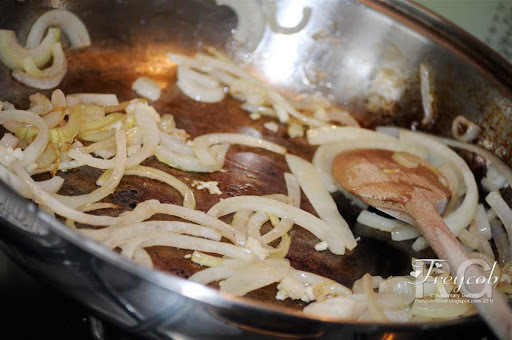 Heat the oil in a large frying pan or wok (I used my paella pan on my Cadac). 4. Add the curry paste (be careful as it’ll spit initially due to the water content). 5. Cook for about 15 minutes until the water has evaporated. You’ll know it’s cooked as when you leave it for a short while, the oil will rise to the surface of the paste. 6. Allow to cool for a few minutes and then decant into sterilised jars. 7. Heat a little more oil and pour over the top of the curry paste to prevent air getting to it. 8. Seal the jars and store in a cool, dark place for a couple of weeks before using. 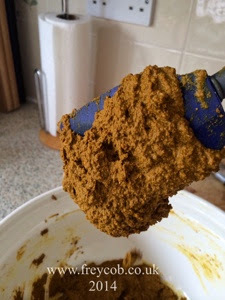 The recipe above is for a mild curry paste, however if you increase the quantities of Paprika, Chiili and Mustard you can increase the heat to your own preference. Similarly, if you don’t have all the ingredients listed above, it’s fine to leave one or two of the smaller quantities out. This goes perfectly in my Chicken Curry Recipe. The curry paste recipe is NOT originally my own, but it’s one we’ve been using for 25 years now. Thanks to Pat Chapman and to Sainsbury’s for a fabulous book – you should re-publish this! 1. Peel your potatoes and cut them into bite sized pieces. 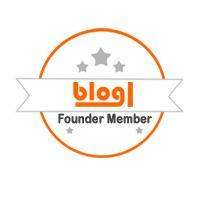 (oops! forgot to photograph them). 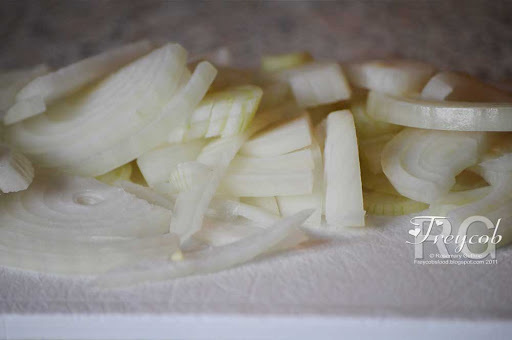 Place them in cold water, bring to the boil and simmer for 10 minutes while you prepare the other ingredients. 4. 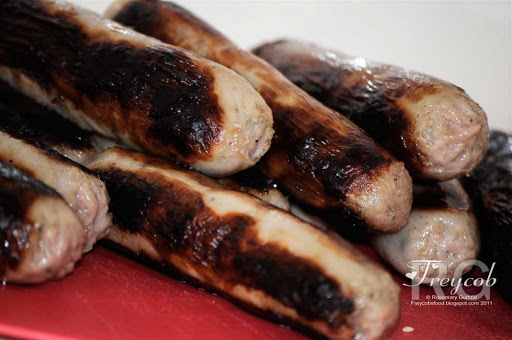 Gently fry your sausages until browned all round, remove and set aside. 5. 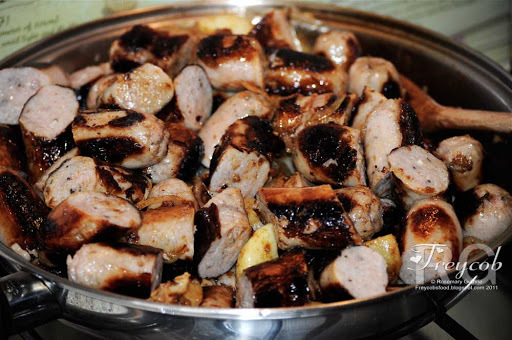 Add a little oil into the pan that you cooked your sausages in and fry for 4-5 minutes until starting to become transparent. Add the garlic and cook for 1-2 minutes. 6. 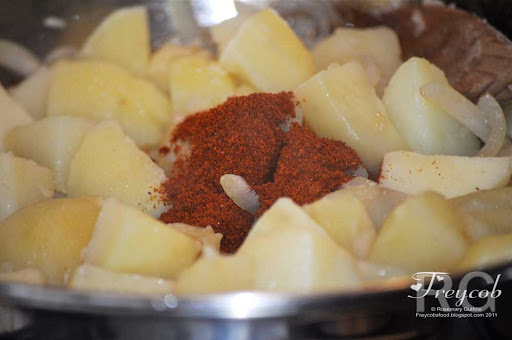 Drain your potatoes and add them to the onions and garlic with the paprika. 7. 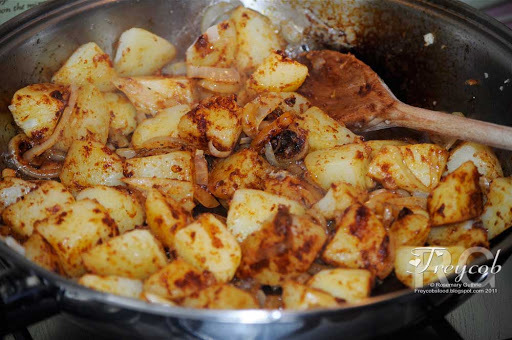 Stir to coat well and cook for a further 2-3 minutes. 8. Cut each sausage into 3 diagonally (only because it makes them look nicer!) and then add them to the pan. Season and mix well. 9. 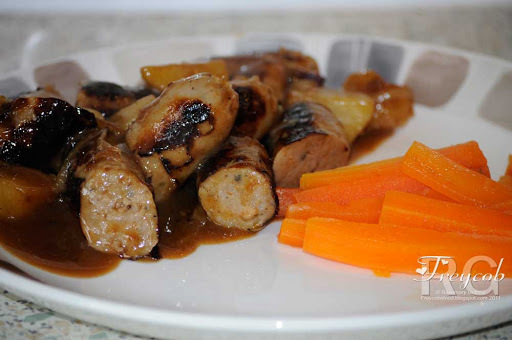 Pour the potato and sausage mixture into an ovenproof dish and pour the gravy over the top. Mix gently to coat. 10. Place in the oven for about 20 minutes until the sausages are cooked through. 11. Serve with steamed carrots or broccolli. 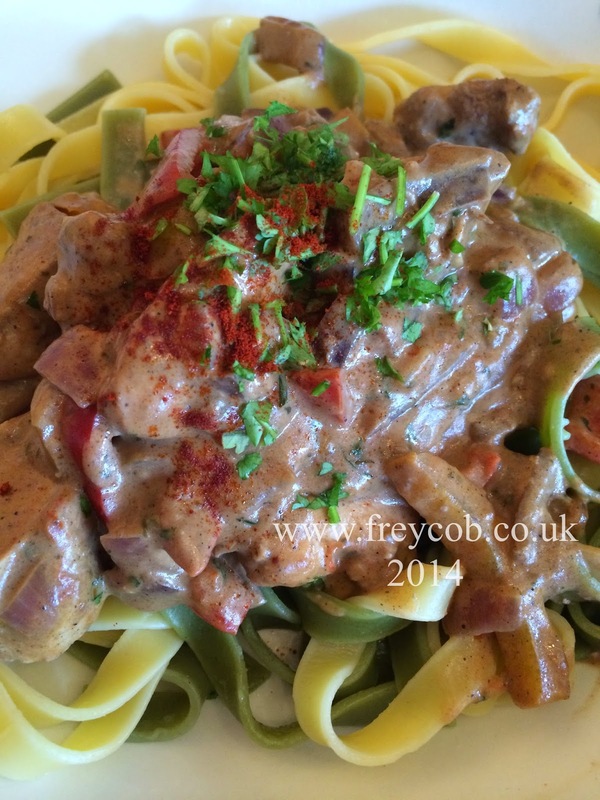 Enjoy, and if you do follow my recipe and like the result, please return and leave me a comment.